Curtesy of Go'way and Ralph on the MB Discord Server. I found this conversation a bit hilarious and I thought I'd share it with y'all. Replied by Xedron on topic The Living Platform. Thank you Nathan, very cool! Replied by MBOUltimate on topic The Living Platform. 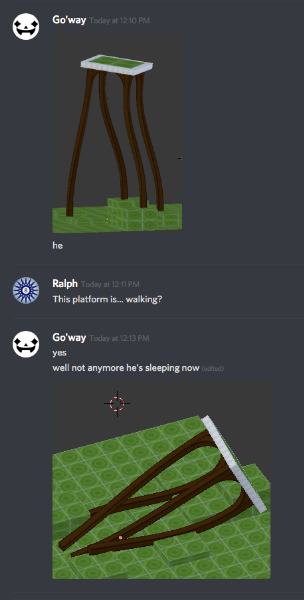 Replied by Alexnico on topic The Living Platform. Replied by Nathan125 on topic The Living Platform. Replied by CyberMedium on topic The Living Platform. Replied by Go'way on topic The Living Platform. Replied by IsraeliRD on topic The Living Platform. Replied by TBNRRedZone on topic The Living Platform. in which context is this a thing? Holy snap, I honestly didn't realize that this post would gain popularity. Thank y'all so much for the comments and funny sayings. Replied by blueoatmeal on topic The Living Platform. Last edit: 17 Apr 2019 00:59 by blueoatmeal. Replied by Steven on topic The Living Platform. Replied by Kalle29 on topic The Living Platform. Replied by FUBAR_WHERe on topic The Living Platform. Replied by Cobalt on topic The Living Platform.